In the trenches of the First World War, the 'Great War', the machine gun was queen of the battlefield. In all the major battles - Somme, Ypres, Passhendaele, Vimy, Arras - it was the machine gun which could decimate whole battalions and which changed the face of warfare. 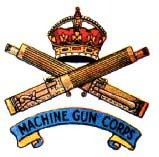 The Old Comrades' Association was formed by Veterans of the Machine Gun Corps after WWI and still survives today. Most members nowadays are relatives or descendents of MGC men or those simply interested in the MGC specifically or WW1 in general. We welcome all. If there is one distinguishing feature of the MGC/OCA, it is its friendliness. New members are always pleasantly surprised when they attend an event for the first time by the fact that they do not feel strangers for long. There is also great enthusiasm. Interest in the Machine Gun Corps has increased considerably. £27 for International (US, Canada, Australia, etc). Prices are for hard copies. If you have a pdf your fee is £20. If you join later in the year, you will receive back issues of the magazine, "Emma Gee" and any other information members have received. "Emma Gee" is published twice per year when possible. The magazine is our main point of contact - it contains a wide variety of items and designed to appeal to the whole cross section of membership. The magazine averages 45 PAGES. Much depends on the articles received. Members are encouraged to contribute articles and items of interest. We have been pleased to feature fine articles by Dr Graham Watson, formerly Lecturer in History at University of Wales and Chief Examiner of History, Welsh Joint Education Committee and author Graham Sacker. If you would like to contribute, please do get in touch. The Honorary Secretary will be delighted to hear from any young people wishing to join or submit an article. The MGC/OCA is one of the friendliest 'regimental' organisations and is INclusive not EXclusive. Now that I have told you a little about us, please browse the site to see how membership of the Association may be of benefit and interest to you. Priority has to be given to the running of the organisation, compiling the magazine, arranging events and to current members. Graham has a website regarding his Machine Gun Corps Research Service www.machine-gun-corps-database.co.uk this is the largest database held by anyone. Thank you for taking the time to read the website before emailing so that questions which are dealt with within the site are not asked again. Copyright Machine Gun Corps Old Comrades' Association.